With this software most happens automatically in the background. It tries to not interact with the user when not necessary, so the user can get on. If a hotspot is detected it asks the user if this is really a hotspot, if so, a browser window is opened, otherwise, we disconnect. When a software update is detected, it is asked if the user wants to update. For Windows and MacOS, on UNIX this is disabled by default (use package manager or ports tree). 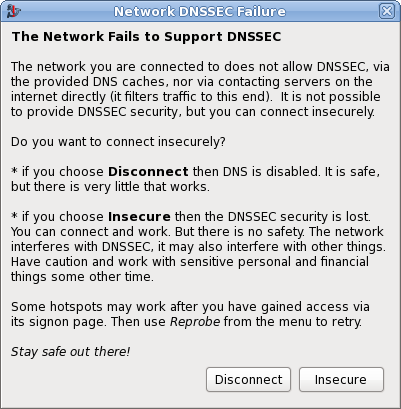 When it all goes wrong, DNSSEC fails and the user is prompted. If the user selects insecure, the tray icon gets a red ! (exclamation mark). When the situation becomes secure again, the tray icon silently changes back. The normal state is this user menu. 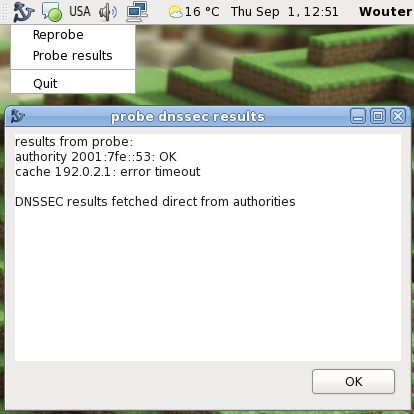 Geeks can click and see the detailed technical results (and complain to the network operator).